How to send SMS for booking reservation in Magento 2? Reminder SMS notifications can turn out to be beneficial for a store and also for the customers. Using Booking Reservation SMS Notification for Magento 2 the store owner can send text notifications to the customers. Customers will never miss out on the bookings which he makes with a store. The text messages notify the customers about the booking status like booking cancellation, invoice generation or when a customer makes a reservation, etc. The admin can also send custom messages to multiple customers, manually. It is not mandatory for a customer to have an internet connection or a compatible hardware device to receive messages. The customers receive notifications on their mobile phones. 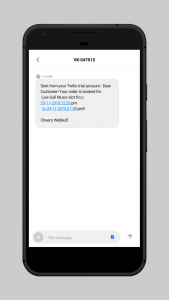 Note: It is essential to integrate Twilio SMS Gateway with the module so as to send and receive notification texts to the customers.